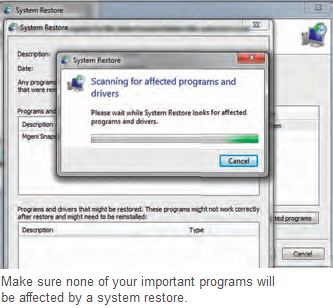 Windows 7 generates recovery points at regular intervals. Before loading of a recovery point you want to know which applications are aff ected by it. Open ‘Start | All programs | Accessories | System programs | System recovery’. You must authorize this instruction by choosing a user account with administration rights and entering the respective password if prompted. Then click on ‘Next’ and mark the desired entry for loading in the following list of the offered recovery points. Finally, click on the button ‘Search for affected programs’ to see which program installations and uninstallations are reversed by the loading of recovery point. Windows presents this information in the dialog box that pops up subsequently.